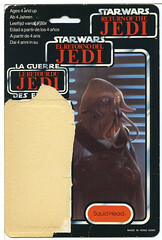 In the Netherlands and Belgium you also had to cut out the nameplates for the premiums, so an cut out name can come from other european sources then the UK. 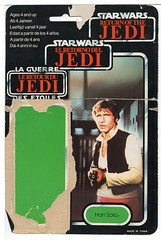 The thing with production in the Netherlands & Belgium, Clipper only actually produced it's own card stock for the first SW 12 backs and the ESB 45 Backs, everything else was released on imported cardstock from Kenner, Kenner Canada, Palitoy and German General Mills, all of which are identifiable by the Clipper stickers applied to the cards, or at least by the tearing or residue left from attempts to remove these stickers. 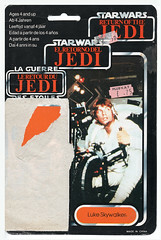 The name plate was used for the offers but the imported cards are still identifiable as being from the Netherlands or Belgium in the vast majority of cases because of the Clipper stickers or evidence that these stickers where once there. 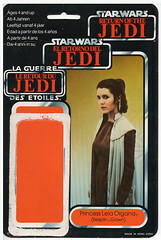 The thing about the imported Kenner cards in the U.K. is that only the offer cards can be identidied as being from the U.K. by Palitoy stickers, all the others are just standard Kenner cards totally indistinguishable from there U.S. counterparts, so again it is likely that the vast majority of Kenner cards with the nameplate removed did originate from the U.K. 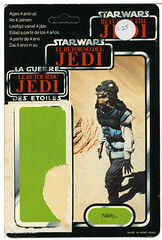 The interesting thing to me is the vast amount of imported Kenner cards which appear to have come from the U.K. because unlike Clipper who only produced two of it's own unique cards, Palitoy was producing it's own unique cards all the way from the SW 12 Back A's right the way through until the ROTJ 65 Back D's and even the Tri-Logo hybrids cards but still must have needed to import card stock from Kenner to meet production demand. 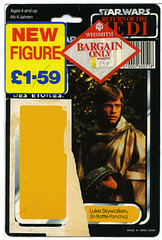 Here's an interesting example of a Klaatu on a Palitoy ROTJ 65 Back with the Clipper wrap around sticker. 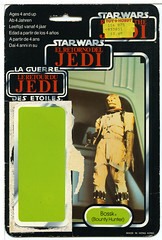 What makes this particular card interesting is that this came from my friends childhood collection and was bought in the U.K. making it possible that Palitoy or some distributers where importing overstock where ever to meet demand, in this case the Netherlands. 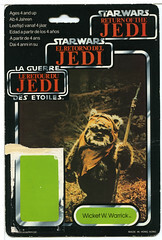 The sixteenth and essentially the last of the Palitoy card, this card features the the same front as the 65 D in the fact it doesn't have the black bar under the ROTJ logo, but the 'ages 4 and up' text has gone back to the multi lingual version like the 65 A, B and C cards. 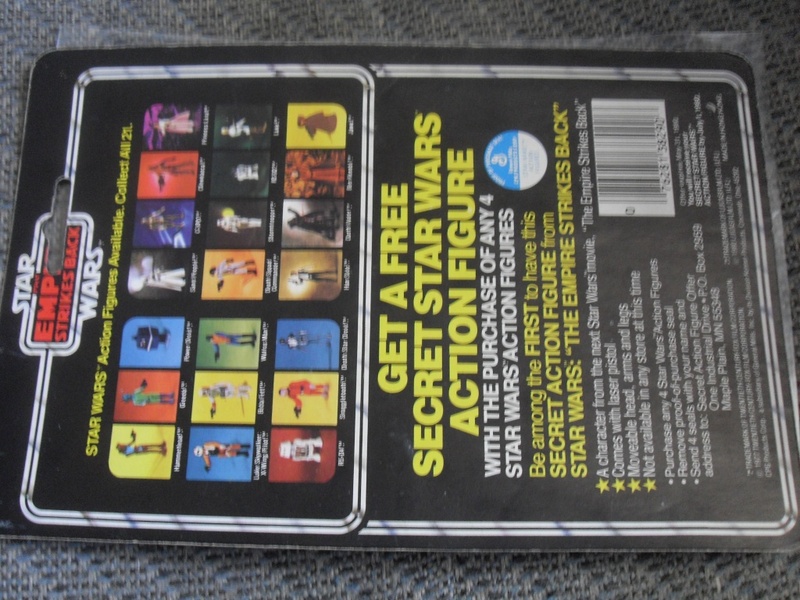 In total, only 6 figures where released on the hybrid card, Both Bespin Security Guards (white and black), Greedo, Hammerhead, Snagglettoth and the Cloud Car Pilot. 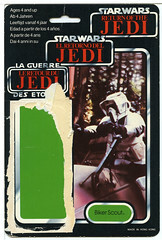 These cards were introduced after the first release of Trilogo cards, exactly with the second weave of Trilogo cards; thinner card, unpunched(dot-cut) hang hole and etched bubble only. 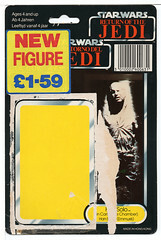 They just re-used an available design to introduce these low selling figures and lowered the cost of designing a totally new cardback. 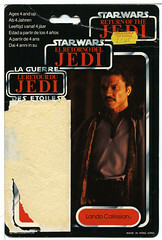 It's almost certain they didn't got the original art to do that. 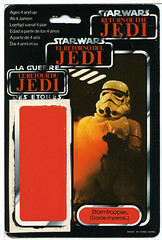 Unfortunately, these cards are always mistaken as hybrid or "transition" cards.... What's totally wrong. 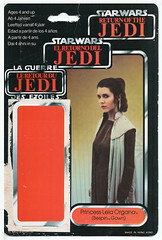 By the way, Palitoy imported their action-fihures already carded from the Far-East. 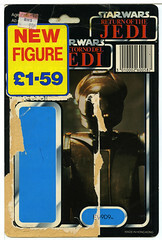 It's only from the ESB 45 "B" that Palitoy blistered their action-figures on their own printed cardback in its factory of Coalville. 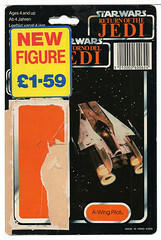 Palitoy also blisterd the 45 back for Clipper and Parker Germany. 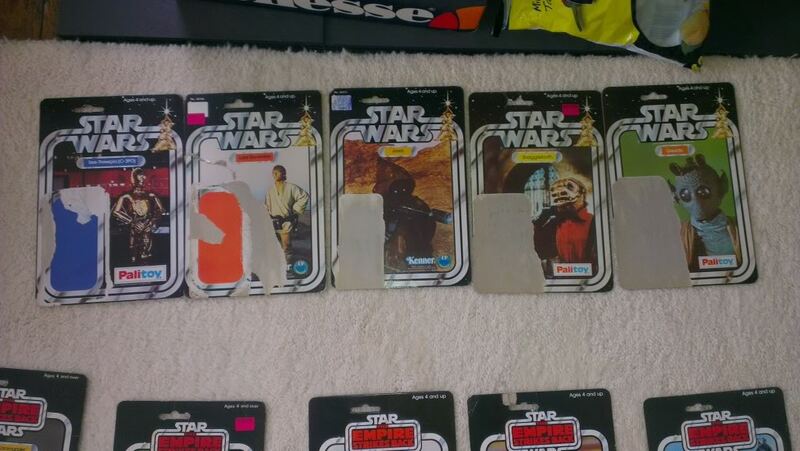 All these 45 back "B" cards were made in UK. Again, a really good work. 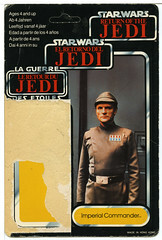 "By the way, Palitoy imported their action-fihures already carded from the Far-East"
So all early Palitoy figures ie. 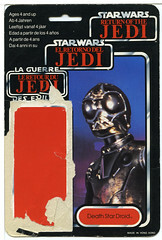 Palitoy VC Jawa same from Asia? 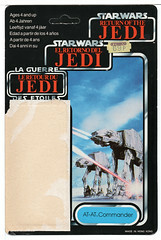 "By the way, Palitoy imported their action-fihures already carded from the Far-East "
Yep, same factory as the Kenner one. 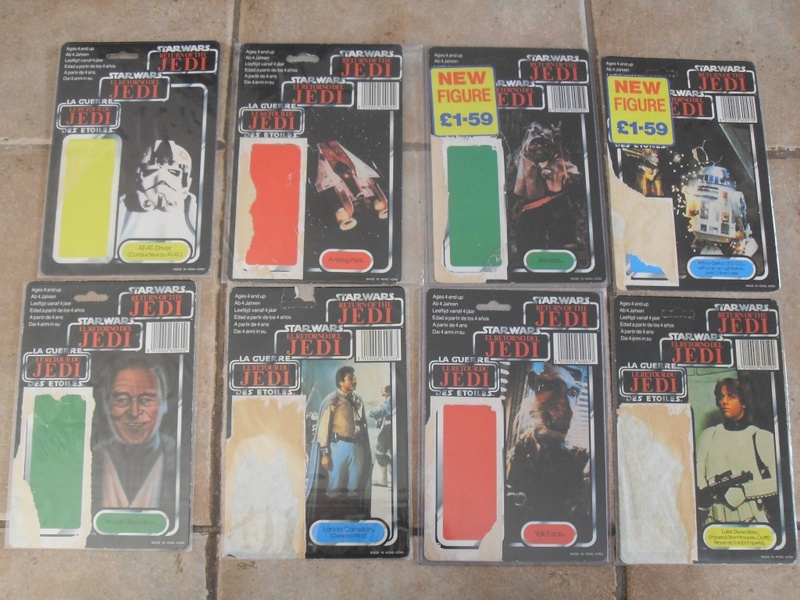 All made by Kader industries in Hong Kong... Also, and as weird as it may sound, it's "Palitoy Far-East Div. ", a division of G.M. Products Hong Kong Ltd. that was in charge of the control of production and manufacturer research. 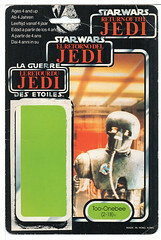 As example, the Palitoy ESB 41 back cards bears a "K" printed next to the "Made in Hong Kong" mention that stands for "Kader", like the Kenner do. Very interesting indeed, thanks for that. 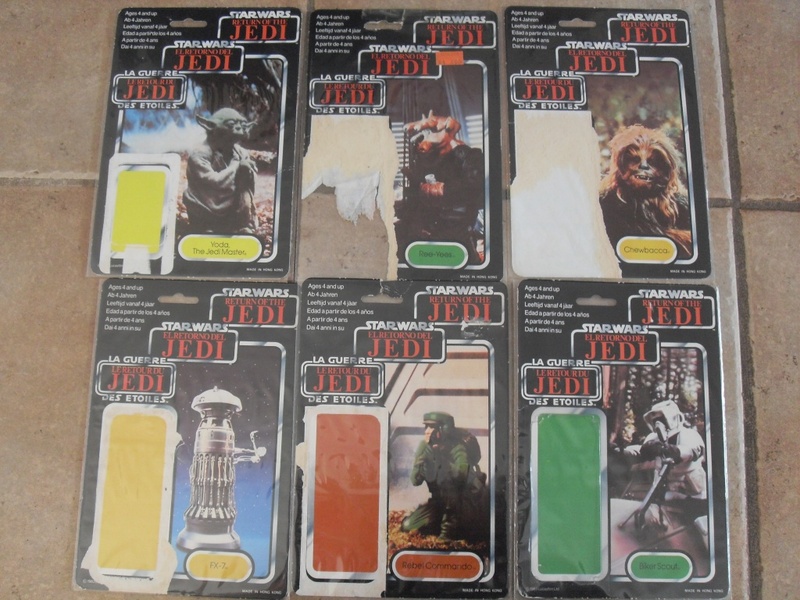 Was it as these factories that they altered the COO stamps then for the European market? 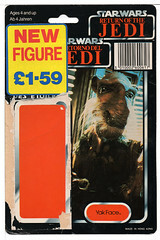 When you said that the 45 b where packaged in the U.K. where the figures still produced in the far east? Or where they being produced in the U.K. as well? 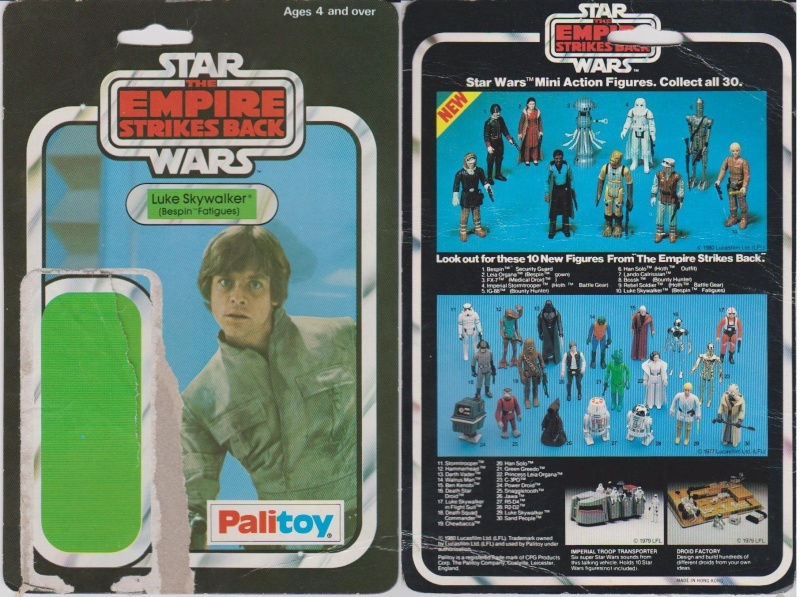 I can't speak for other figures, but for Bespin Luke it was the 45 c where all the interesting variations first appeared i.e. 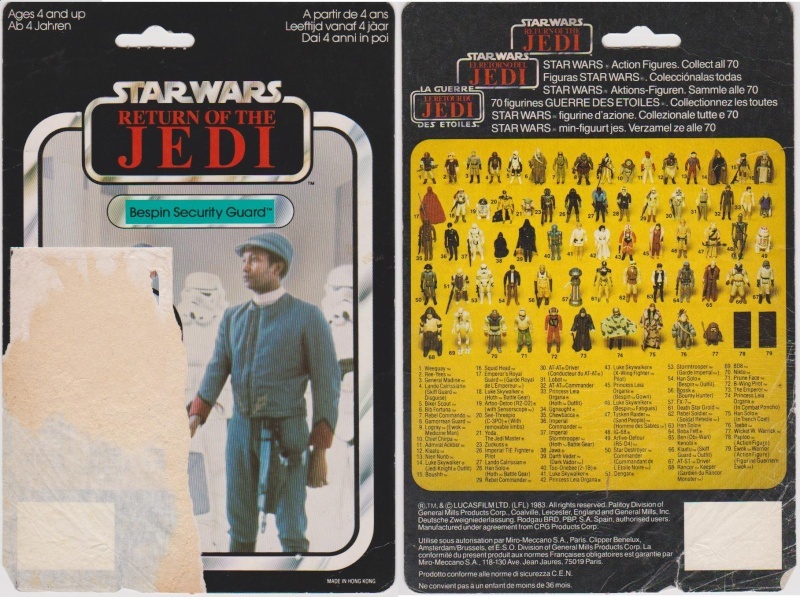 dark boots versions and the main no COO versions, Bespin Luke was never released on the 45 b that I'm aware of, but the time frame can't have been too far off. 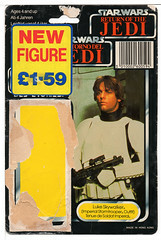 The 45 C was definately one of Palitoy's most abundant card as well. 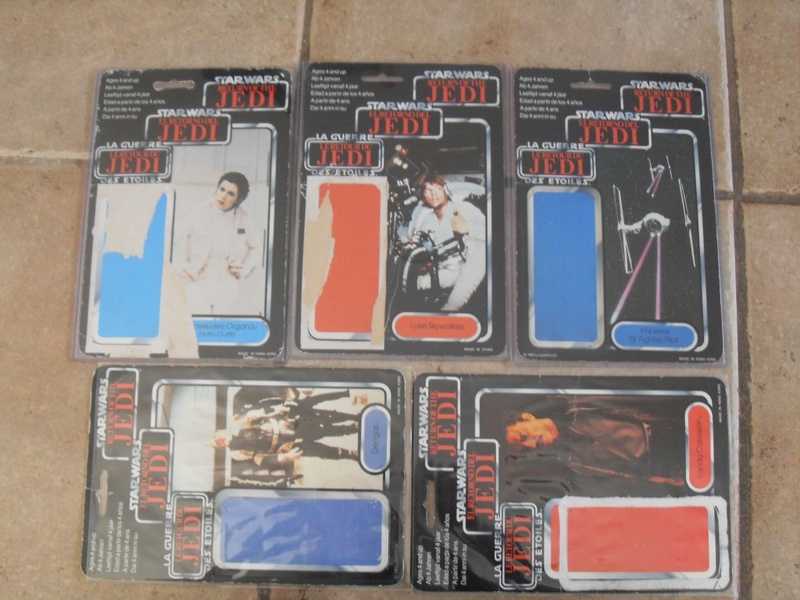 Was it as these factories that they altered the COO stamps then for the European market? No, you don't alter a COO for a specific destination. COO stands for Country Of Origine, or manufacturing. Never for destination. The alteration in the Far-East region is mainly due to a political decision when in 1983, United Kingdom reclassified Hong Kong from a British crown colony to a dependent territory, slowly passing under China control. They still produced in the Far-East but in less quantity. 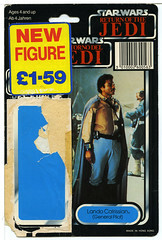 U.K. never produced action-figures. 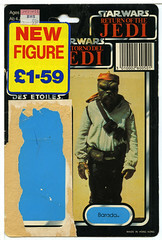 The only place in Europe where action-figures were produced was Spain. 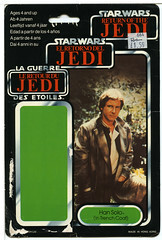 France and U.K. only produced some spaceships and playsets, never action-figures. 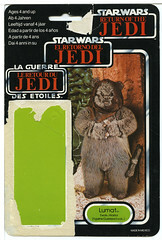 Personally, i am not a fan of COO variations nor a loose collector. I saw too much absurdities said on the matter. Nothing is white or black. People must accept that different alterations may come from a same factory. 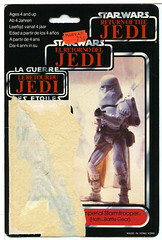 An action-figure is not the same from the first batch of production against the last one produced from an eroded mold. 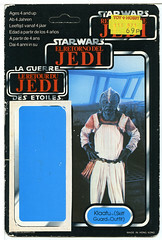 Paint scheme may also be altered during a production from a same line of manufacturing. 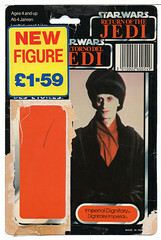 And last, Far-East factories never exported unpainted production to be painted in Spain.... NEVER!!!! This is just ridiculous. 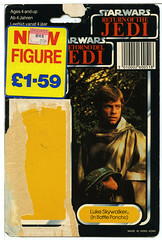 You must be mistaken but the Luke Bespin was released on Palitoy ESB 45 "B" card. 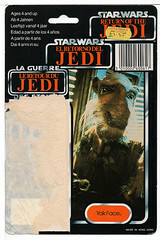 I apologise, yes you are right, I have the same picture in my file but over looked it. 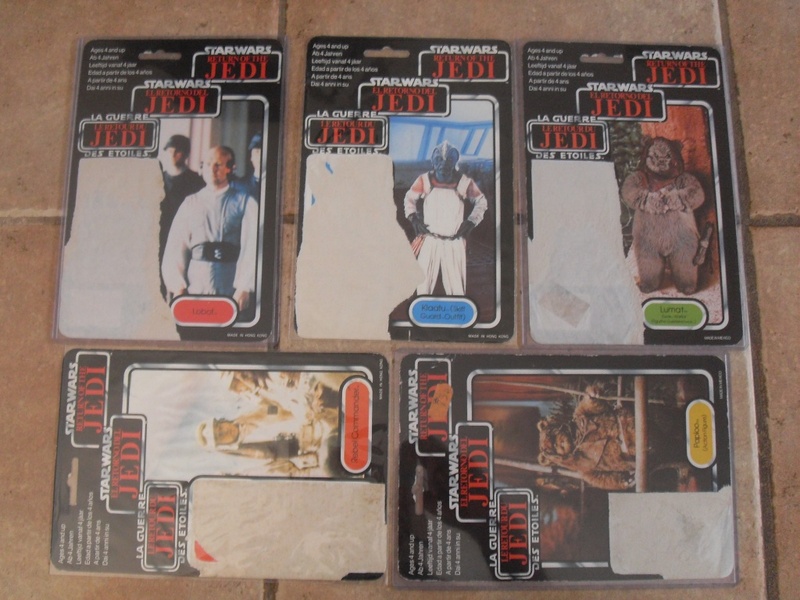 Yes it is Rancor, my friends Dad used to mold Falcon's and AT-AT's from his memory (which may be incorrect) I think from a previous thread we found a B-Wing with a U.K. stamp also. Like you say though, production on that scale in one factory would be impossible. 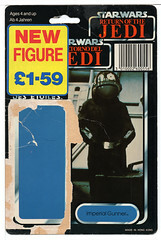 Have you seen this video from Youtube, I know it's difficult to really say where the footage came from, but if it is entirely from the U.K. the brief pic you see of the Zuckuss being carded is a 45 C? 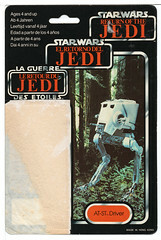 Check out the way the woman just cracks them AT-AT legs down, bet she wears the trousers in her house! 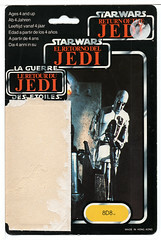 This footage is from the assembly line at Palitoy where you can also see the packaging section. One aspect needs a follow up, I think. 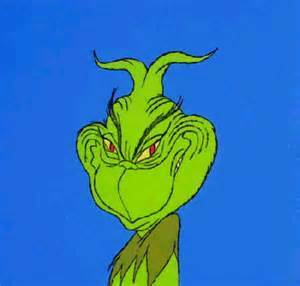 Just keep in mind it is still a working theory based upon what I read in discussions mixed with some of my own ideas. Like with every theory various aspects of it it still need to be verified by sound evidence. Please challenge this theory, so it can be improved. So let's discuss this further in the POCH/PBP thread. In the end we all are interested in a valid theory. There's some really great discussion and information developing in this thread. 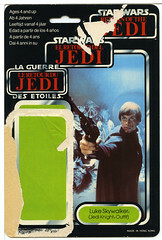 I liked your post about identifying the various Palitoy cards Alex. 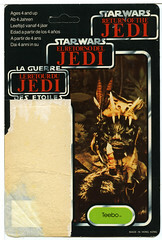 I'll be able to get mine properly catalogued now. Thank you or sharing your knowledge JC, I've leant quite a bit reading your posts. 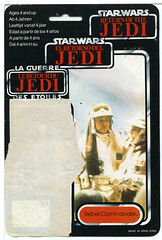 Nice cardbacks fellas Love the group shot on the back of that Palitoy card and those are some awesome looking Ledy cards. 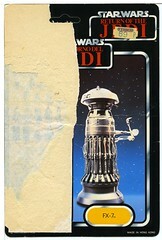 I really like that alternate photo for the Artoo. Keep em coming! Jason, thanks for adding them. That is a fantastic start to a collection. 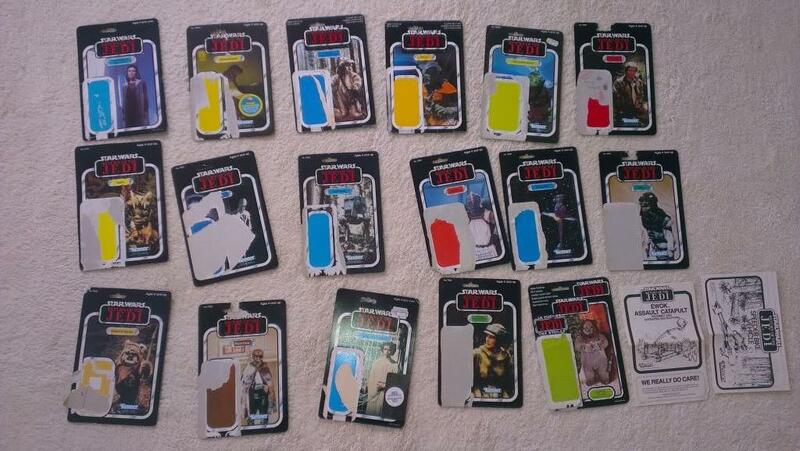 Here are my childhood cardbacks, all bought in the UK, in the Midlands, mostly from Goldie Toys. 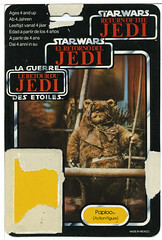 Please let me know if you come across any cardbacks with Goldie Toy stickers. 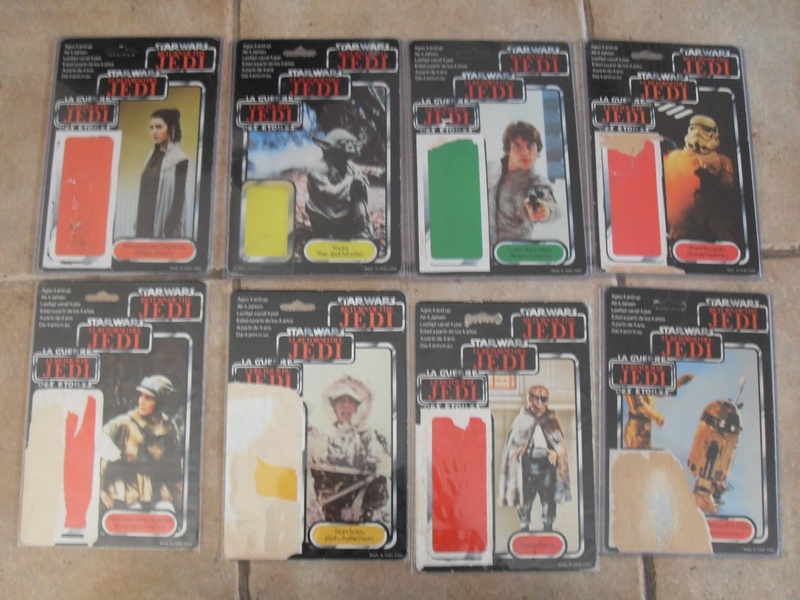 I'd love to put a full set together! 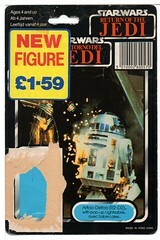 It wasn't all Palitoy in the UK. 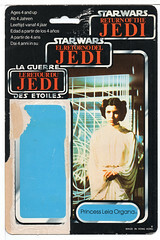 So the Star Wars ones were a mix of Kenner & Palitoy cards. 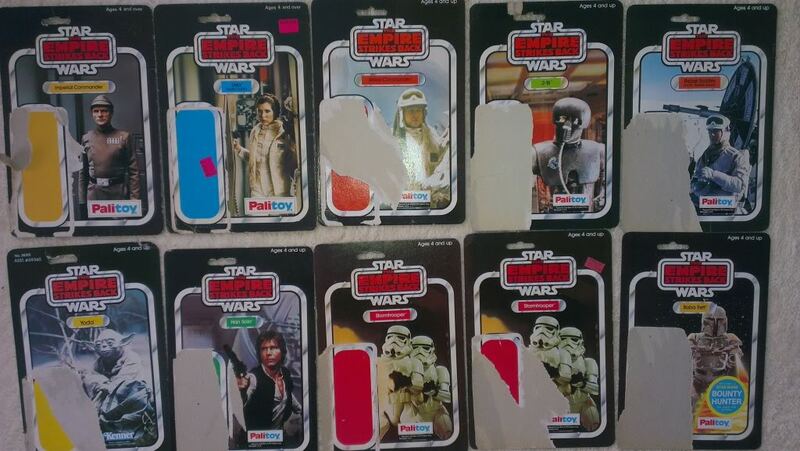 Empire cards were mainly Palitoy. 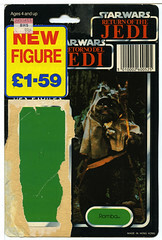 I think Yoda was a hard figure to get at that point in the UK, hence Kenner cardback for this little dude. 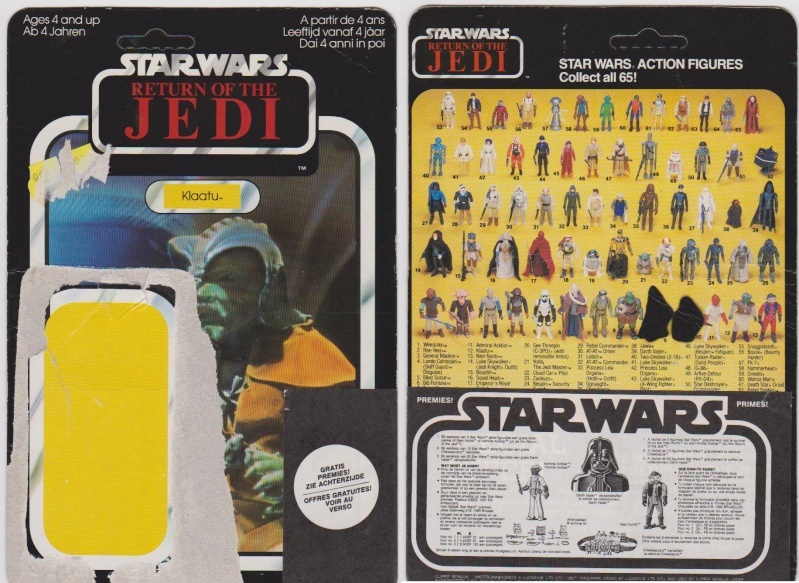 My Return cards are a mix of Kenner & Pailtoy. 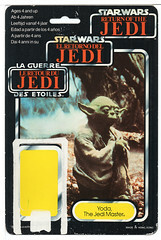 Nice cards Paul, Obviously as a kid I was more intersted in getting the figure out to play with as I saved nothing!! 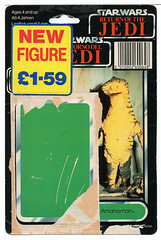 Hybrid Greedo & MOC Gam Guard & Rancor keeper missed out on the photo shoot!